Israeli Ambassador to the UN say President Trump's peace proposal complete, to be presented early next year. Middle East peace plan early next year, Israel's UN envoy said Tuesday. 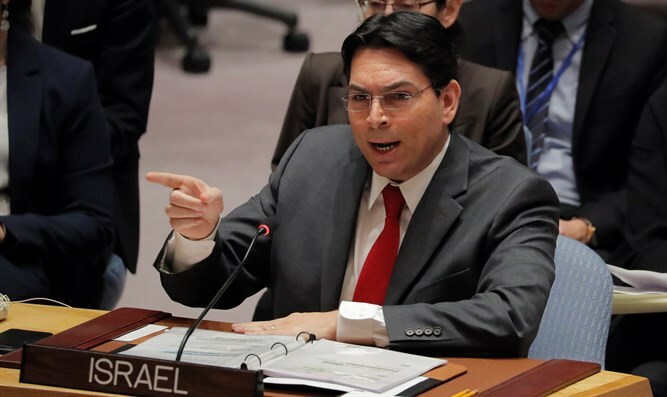 Israeli Ambassador Danny Danon told journalists that the peace plan was "completed" and that the administration had discussed timing with Israel to unveil the proposals. "As far as we know, they speak with us about beginning of '19, which is coming soon," Danon said. "We don't know the details of the plan but we know that it's completed." Israel will come to the negotiating table to discuss the plan, Danon said, but the Palestinian Authority will try to block it even as the United States tries to bring other key countries such as Saudi Arabia, Egypt and Jordan on board. The PA has severed ties with the Trump administration after his December decision to move the US embassy in Israel to Jerusalem and declare the city Israel's capital. The US administration has also cut more than $500 million in aid to the PA.
Trump said in September that he planned to unveil the peace plan by the end of the year, and has suggested that the proposals could provide for the creation of a Palestinian state.